Thanh Hoa is located at the head of the narrow waste that connects with the \'head\' of northern VietNam. It is bordered on the north by Son La, Hoa Binh and Ninh Binh; on the south by Nghe An; on the east by the coast of the South China Sea; on the west by the Laos border. Beside famous Sam Son beach, beaches such as Hai Tien, Hai Hoa and Hai Thanh are beautiful places that you can choose if you are going to swim this summer. With 100 km of coastline, Thanh Hoa province has many beautiful beaches for tourists to visit. Known as one of first beaches exploited in northern provinces, Sam Son beach is located in approximately 16 km east of Thanh Hoa city. In the past, French used it as a private bathing spot from 1906 with many old villas, including villas of Emperor Bao Dai. 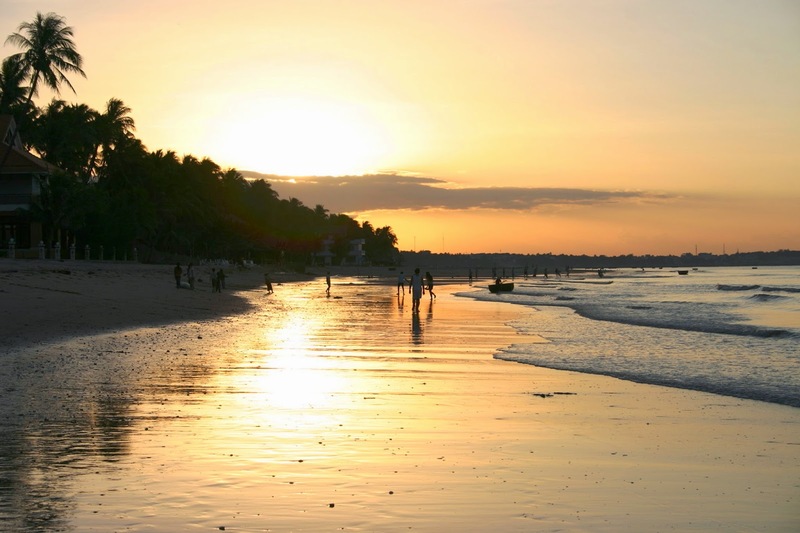 In fact, this beach is 10 km length with big waves, soft water, fine sands and moderate salinity. Not only having beautiful beach, Sam Son has many beautiful and historic sites. They are is Le where Truong Le contacts with the sea, Doc Cuoc temple (Gam temple) lying on the top of Co Giai mountain and Trong Mai clot. To go to Hai Hoa Sea, you go from Thanh Hoa city to Cong town, Tinh Gia district about 40 km and then turn left more 3 km. Hai Hoa Sea has been well known in recent years while beaches along the country have begun to be exploited into tourist areas. It retains pristine features with white and soft sandy beaches and romantic green casuarina groves all year. The sun rises, bustling fishing villages become noisy. Fish markets open on the beach with fresh shrimps. The sun is on high, these markets close and everything returns quietly. Hai Hoa Sea is friendly and do not have many tourist services and vendors. The beach is beautiful and pristine. The water is clear and blue while waves are calm. Guests can savor fresh seafood, enjoy salty taste of the sea and catch fish with fishermen. In particular, only Hien Hoa beach has specialties such as jellyfish salad with hot sauce, jellyfish salad with fig leaves and pancakes. Hai Thanh beach is in Hai Thanh commune, Tinh Gia , Thanh Hoa. It is about 4 km length stretching from Thoi Mountain’s nose to the foot of Du Xuyen Mountain. This beach is small and calm waves with tranquil fishing villages. Offshore is Hon Me with about 10 small islands. In here, you can not only take a rest and a bath but also have a chance to visit many historical places like Dot Tien temple, Quang Trung temple and parish churches of Ba Lang with the history of about five centuries. Hai Thanh has bustling fishing village s. There are very famous fish sauce, Ba Lang fish sauce and fresh products such as crab, mussels, shrimps, clams, and buckets. Hai Tien Beach is situated 175 km away from Hanoi and 30 km from Thanh Hoa city. To reach this beach, you have to follow along the National Highway 1A , turn over Tao Xuyen bridge, turn left and go straight about 15 km. Hai Tien Sea has just been put into tourists for several years with length of 12 km. For fresh air and long sandy beaches you can select privacy places to bath while you are clean and safe. In fact, Hai Tien beach still remains many wild features with no development services. Apart from a few motels and restaurants, you live in completely natural surroundings with tranquil blue waters and peaceful fishing villages. You can go to seafood markets in the early morning, buy things and ask to help cook or order fresh and delicious food at local houses with the reasonable prices.